Abstract: The United States spends more than $250 million each year on the American Community Survey (ACS), a labor-intensive door-to-door study that measures statistics relating to race, gender, education, occupation, unemployment, and other demographic factors. Although a comprehensive source of data, the lag between demographic changes and their appearance in the ACS can exceed several years. As digital imagery becomes ubiquitous and machine vision techniques improve, automated data analysis may become an increasingly practical supplement to the ACS. Here, we present a method that estimates socioeconomic characteristics of regions spanning 200 US cities by using 50 million images of street scenes gathered with Google Street View cars. Using deep learning-based computer vision techniques, we determined the make, model, and year of all motor vehicles encountered in particular neighborhoods. Data from this census of motor vehicles, which enumerated 22 million automobiles in total (8% of all automobiles in the United States), were used to accurately estimate income, race, education, and voting patterns at the zip code and precinct level. (The average US precinct contains ∼1,000 people.) The resulting associations are surprisingly simple and powerful. For instance, if the number of sedans encountered during a drive through a city is higher than the number of pickup trucks, the city is likely to vote for a Democrat during the next presidential election (88% chance); otherwise, it is likely to vote Republican (82%). Our results suggest that automated systems for monitoring demographics may effectively complement labor-intensive approaches, with the potential to measure demographics with fine spatial resolution, in close to real time. The researchers created an algorithm to identify the brand, model and year of every car sold in the US since 1990. The types of cars also provided information about the race, income and education levels of a neighborhood, the study said. Volkswagens and Aston Martins were associated with white neighborhoods while Chryslers, Buicks and Oldsmobiles tended to appear in African-American neighborhoods, the study found. Linking lifestyle choices to voting behavior as well as other social traits. Researchers and marketers have done this for decades. For example, see this earlier post about media consumption and voting behavior. This hints at the work Bourdieu who suggested class status is defined by cultural tastes and lifestyles in addition to access to resources and power. Connecting different publicly available big data sets to find connections. Google Street View is available to all and election outcomes are also accessible. All it takes is a method to put these two things together. Here, it was a machine learning algorithm by which different kinds of vehicles could be identified. It would take humans a long time to connect these pieces of data but algorithms, once they correctly are identifying vehicles, can do this very quickly. Of course, this still leaves us with questions about what to do with it all. The authors seem interested in helping facilitate more efficient national data-gathering efforts. The American Community Survey and the Dicennial Census are both costly efforts. Could machine learning help reduce the effort needed while providing accurate results? At the same time, it is less clear regarding the causal mechanisms behind these findings: do people buy pick-up trucks because they are Republican? How does this choice of a vehicle fit with a larger constellation of behaviors and beliefs? If someone wanted to change voting patterns, could encouraging the purchase of more pick-up trucks or sedans actually change voting patterns (or are these more of correlations)? While these numbers are sure to contribute to political debate about current policies, they continue trends started in the late 1960s where immigration policies were changed. Additionally, the projections suggest the United States is still a desirable place to immigrate to and that the growing foreign-born population is a significant contributor to the overall growing population of the US. 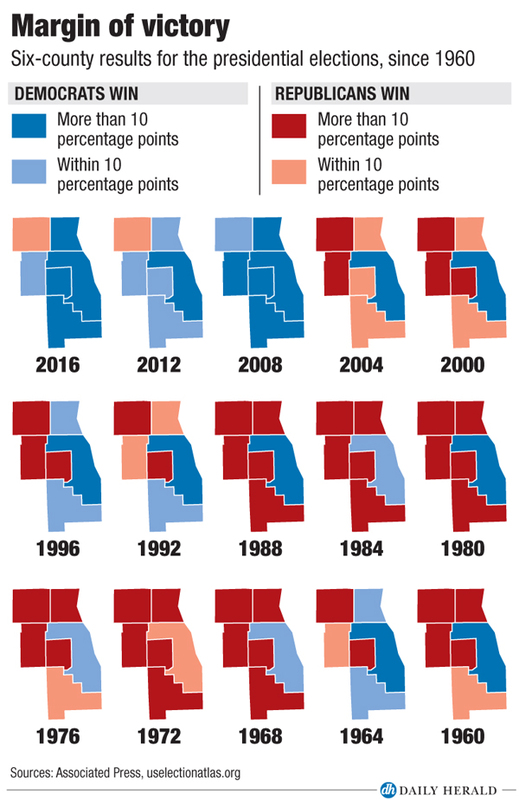 I would be interested to hear about the discussions behind the scenes regarding the 14 year gap in making such projections. How much of this was guided by politics? What are the upper and lower bounds of the confidence intervals for these projections? Have our projection abilities improved significantly? 266 US counties have white populations under 50% but are the same processes at work in all of them? Pew crunched Census numbers from the 2,440 U.S. counties that had more than 10,000 residents in 2013. 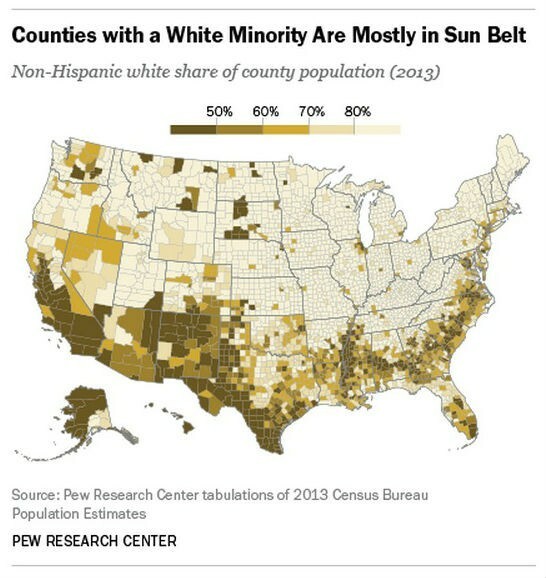 Whites made up less than half the population in a total of 266 counties. Even though these 266 counties made up only 11 percent of the counties analyzed, they contained 31 percent of the country’s total population, with many of them home to dense urban areas. Most of these counties are sprinkled around the Sun Belt states in southern part of the country (below). Of the 25 counties with the largest total populations, 19 now have non-white majorities. As of 2000, six of these (four in California and two in Florida) had white majorities. The most dramatic change within the last decade can be seen in counties in Georgia. The share of white residents in Henry County, for example, fell from 80 percent in 2000 to a little less than 50 percent in 2013. 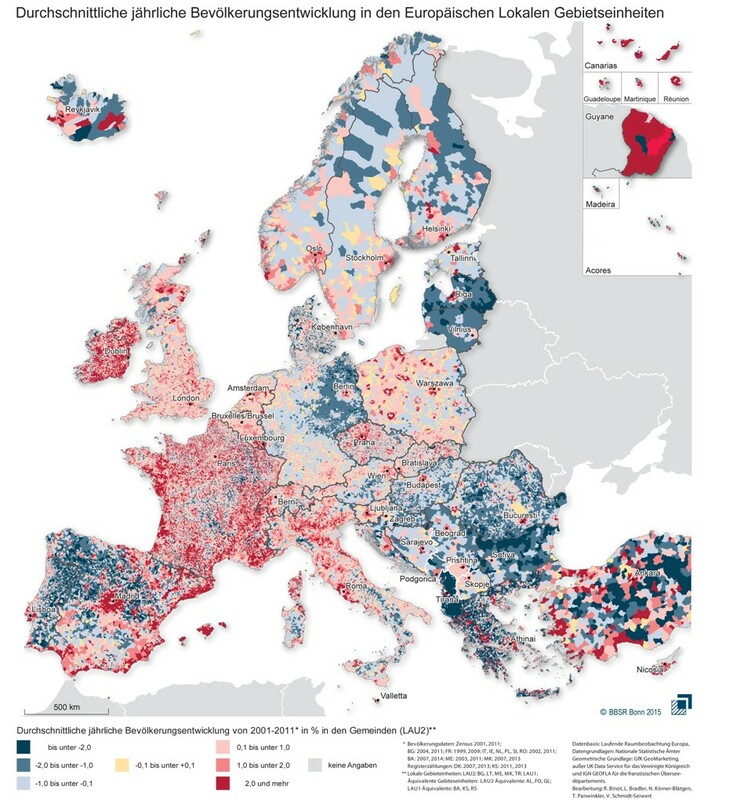 It is interesting to see where these counties are located and think of the social forces that led to this. Not all of these counties have the same mix of minority groups or the same history. Some of the counties are those with large cities where white populations declined with suburban growth. Some of the counties are in the South with large black populations. There are some counties in the Great Plains, southwest, and northwest that have large Native American populations. There are counties with large Latino populations, largely in the southwest and those involving immigrant gateways. There are also some counties with large Asian populations – the phenomenon behind the concept of ethnoburbs – though I wonder if there are many with 50% or more Asians. Thus, while this data corroborates the ongoing trend of whites constituting a smaller percentage of the American population (currently around 63%), the increasing minority population is not monolithic nor does it influence all places in the same ways.